We now offer a range of hosted or cloud-based software functions to help small businesses and not-for-profits. Office 365™ is a full service online version of Microsoft Office™ plus Skype for Business, OneDrive™ and SharePoint™. Hosted backup uses a desktop app to manage periodic data backup + restore services to help effortlessly your key data. 'Rent' these key business services on a simple pay-as-you-go basis with no contracts. Save time and money by using key business software and facilities as cloud-based services rather than relying on potentially expensive and labour-intensive local installations. This is an online version of Microsoft's workhorse productivity suite providing access to Word, Excel and Powerpoint™. By accessing the programmes online, you are able to use them in the office, at home or on a customer's computer without needing to own or install any software. Create new documents, upload exisitng files, share/collaborate files with colleagues also using Office 365™ in your organisation's account. Every account comes with 1TB of personal storage via OneDrive™; access to Sites™ for document sharing/collaboration; Skype for Business App; One Note™. There is also an option for business-class email using the Microsoft Exchange™ platform, but to use this you will need to transfer all email accounts in your organisation over this service; Office365™, however, can be used by just one person or a sub-set of your team. 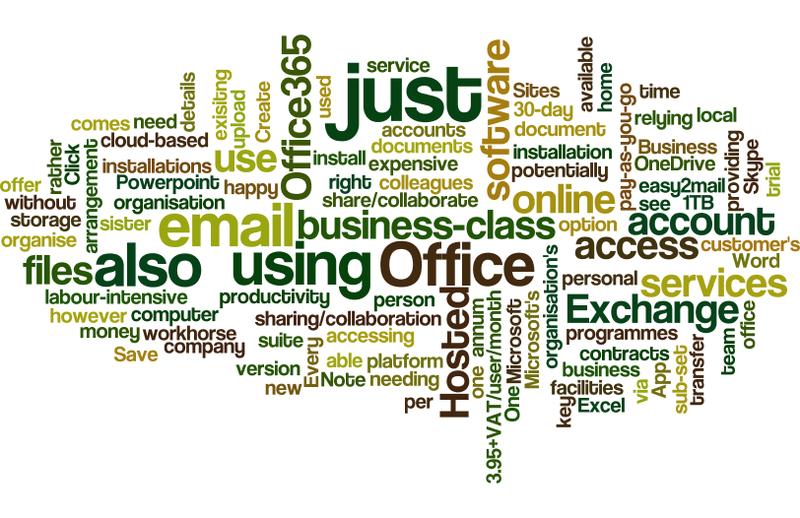 Office 365™ is available for just £3.95+VAT/user/month with no contracts, just a 30-day pay-as-you-go arrangement. That's just £48 per annum. We are happy to organise a trial installation to see if Office365™ is right for you. We also offer Hosted Exchange™ on it own for business-class email through our sister company easy2mail. Click here for details. Working with our partner Giacom Networks we are able to offer business-class backup and restore services, storing your key files safely in the cloud. Using a free downloadable desktop app for Windows or Mac, our service will seamlessly save your files online in mutli-server, distributed, offshore data centres. So much better than trying to remember to backup to a USB-drive or DVD. Backups run automatically on any schedule you select. There is also a server version to allow whole networks to be backed up as an alternative to or in addition to tape-based backup. Personal versions offer 25GB, 100GB or 250GB of total storage. You have total freedom to backup at a drive, folder or file level. After your initial data dump, backups will only be made to files that have actually changed - in fact it will only backup the parts of individual files that have been altered. This makes for fast and bandwidth efficient backups. Pricing is set out below. Server level options provide 150GB, 500GB, 2TB or 5TB options. Backup works in the same efficient manner as the personal service. Pricing is set out below. Restore - restoring files works on a file, folder or drive basis or a full data restore in the event of a total loss. Using the same app as for backup, saved files can be pulled down quickly and easily from the backup servers. All prices are per user or installation per month. All agreements are subject to bandwidth limits.